Tragically, America has just suffered another mass shooting leaving more of our fellow citizens grieving lost family members. Even more tragically, that sentence could stand unaltered for every week of President Obama’s second term to date. The President is visibly, understandably, commendably outraged about this, and unwilling to pretend this violence is merely coincidental or beyond our control. Unfortunately, despite many efforts, so far he has been equally unable to do anything to stop this bloodbath. In part, this is because he has been blocked at every turn by an obstructionist Congress. But even more so, it is because those lawmakers in their turn are guided by an American gun culture that has been growing if anything stronger and less constrained even as the horrors of gun violence have been growing more terrible and tangible. Americans – at least, a very large minority of Americans – just love our guns. But more than that, we have been taught to believe in the IDEA of our guns. Firearms in American culture aren’t piece of sporting equipment, a tool for hunting, or even a means of self-defence. They are regarded as a civil right, second only to the freedom of speech in the Bill of Rights. But it’s time to come out of the closet on this. I’ve been telling a lie of omission. Because I just, in no way, regard access to deadly firearms as a right to which a free citizenry are entitled. I’ve always been vaguely uncomfortable about that belief, just on the grounds that I know you should always be wary of the impulse to take away rights that you personally don’t happen to value (hello there, male anti-abortion extremists!). And I’ve hesitated to write about gun control issues too much in the past. Because, there’s a symphony of shouting every time this issue comes up, and what can I have to add? Well, on reflection, I do have something to add, and I hope it might be of use to my friends back home who haven’t yet given up on the idea that we might be able to do something about this problem. As President Obama, and many others have pointed out, the United Kingdom is one of those countries where we’ve actually changed our gun laws – most recently, as a reaction to a terrible mass shooting in Dunblane, Scotland. Death by gun is now vanishingly rare in the UK, but 100 years ago firearms were as unrestricted here as they are in America today. If firearms are a civil right, then they are a civil right that has been deeply constrained here in the UK. And yet, I have never had the sense that British people feel that they are making any kind of sacrifice or difficult trade-off in surrendering their “right to bear arms”. Perhaps, though, there was more to this than I know. If firearms are a right to be treasured, and if (as the NRA argues) they are vital for personal self-defence, then logically some people must feel less safe and less free for the absence of the guns. So people are afraid of this idea. Very much so. · Emigration: Lots of folks said they’d leave the country. I pushed back on some of these, asking them whether they would REALLY leave behind friends and family, or if that was just a knee jerk reaction. Most said on balance that it probably was a knee jerk response, but stressed that they would feel genuinely uncomfortable, and that was not the sort of country in which they wanted to live. · Confusion: Loads of people wondered why on earth such a thing could ever happen. “No one wants this,” someone wrote. There was a general sense of bafflement as to why such a thing would ever be contemplated, even as a hypothetical question. 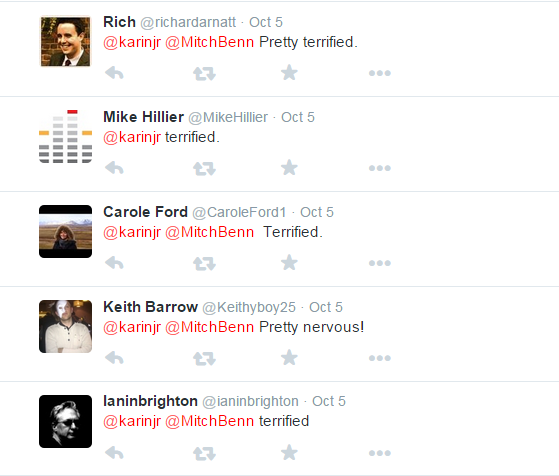 These were the most common reactions, and they were very, very consistent. But there was another, minor thread of the discussion that I hadn’t expected, and that really made me think about this in a new way. I was intrigued by this, so I wrote back to learn more. But they aren’t of course. They are just very tightly and strictly regulated. They are a privilege that can be earned. Suddenly I had a LOAD of questions. How would I go about getting a gun if I wanted one? What counts as a “good reason” for having one under British Law? Who actually issues gun licenses, and what’s the process? This is probably the biggest difference between the US and the UK. In Britain, you are not allowed to arm yourself specifically for the purpose of protection against future possible attack. This doesn’t just apply to firearms – you aren’t allowed to carry around knives or mace or anything that is specifically intended to be used as a weapon in case of attack. This isn’t the same thing as saying you don’t have a right of self-defence – you do. If you are attacked, you do have the right to fight back with whatever materials are at hand. To use a concrete example, you would not be allowed to carry a kitchen knife with you in case someone attacks you, but if you ARE attacked in your kitchen you are free to grab a knife and use it provided that this defence is “reasonable”. That means, if someone is grabs your purse and runs off, you’re not allowed to come after him with the knife. This is the aspect of British gun law that seems most alien to American sensibilities – and it really is quite an extraordinary difference in beliefs. Essentially, in Britain you sign up to a social contract that says collective security (knowing that no one is armed) is more important than an individual right to be armed in defence. One reason this works here is because, as seen by my social media responses, there are very few people here who believe carrying firearms would make them personally safer. This principle is also important, because so many other things follow on from it within the system of laws – if there’s no right to self-defence, then the “good reasons” to be armed are limited to things like hunting and sport. And there is then no good reason whatsoever to need a loaded weapon in your home at all times. This part of British law actually isn’t all that alien to American thinking – we have banned certain types of firearms before both nationally, for instance assault weapons under the Clinton Administration, and locally, for instance the handguns ban in DC (the fact that both of these measures were overturned is just… depressing evidence that this issue is really freakin’ hard in America). In Britain, assault weapons, automatic weapons, and handguns are simply banned outright. Permanently and nationally. The licensing system for firearms warns that it takes a minimum of 8 weeks to achieve a license – which sounds like a long time in the context of America’s raging debate over 48-hour waiting periods, but two months isn’t actually that long to wait. Typically it takes longer to get a driver’s licence. 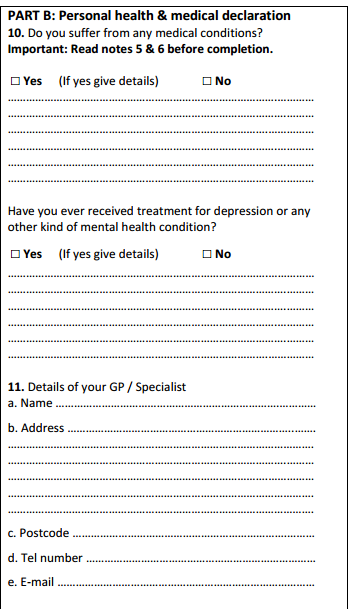 As part of your firearms application in Britain, you must declare any illnesses that may affect your ability to safely use the weapon – and this includes any mental illnesses, such as depression. What’s more, you are asked to provide the details of your doctor, and to waive medical confidentiality for the purpose of allowing the police to confirm this information with them. You have to declare any criminal convictions, including those which are already “spent” (i.e., you have served your time and are no longer under parole). In most cases, a serious conviction will prevent you from being able to get a license, but even traffic convictions must be reported. You have to supply contact details for 2 people not related to you who have known you for at least 2 years so that the police can follow up with them as references. You have to confirm how you will be securing your weapon, and whether you will do that at home or at another location (e.g., at a gun club). One little hiccup – if you plan to go hunting with your weapon, you also need to provide the name of a person who has given you permission to shoot on their land. Remember, you can’t just go into the public woodlands to hunt. So you need a landowner who can confirm your right to hunt there. As a result, of course, guns are now pretty much the purview of serious hunters or sportsman and there just aren’t that many of those. So, laws and culture both play a huge role in the way that our two societies have coped with firearms, no doubt. And here in Britain, there is a complex network of laws that reinforce and maintain a strong aversion to widespread gun ownership. 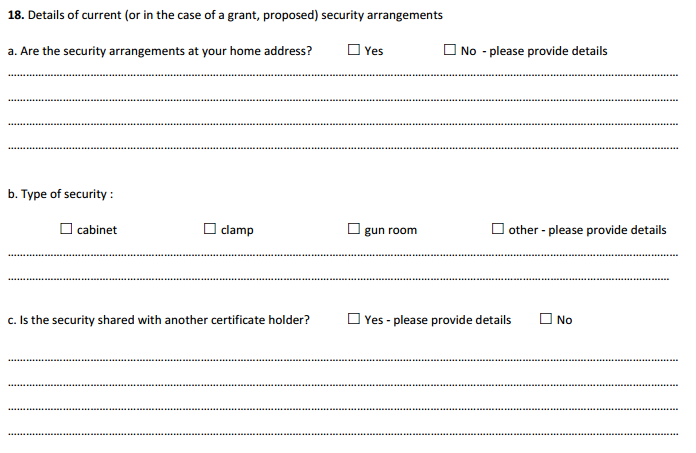 If my fellow Americans want to know now they might restrain guns more through laws, Britain offers a wide range of restrictions and regulations that they could consider. But even more, it offers a culture that has fully rejected general access to firearms for reasons of personal security and societal stability. We’ll need to learn that lesson too, if such laws are ever going to work. Final parting statistic: here are the respective gun deaths per 100,000 people in the UK and the US respectively.